Chart No. 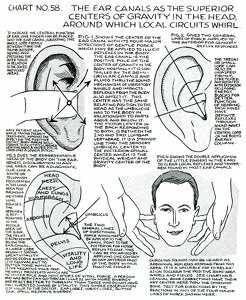 58 - The Ear Canals as the Superior Centers of Gravity in the Head, around Which Local Circuits Whirl. 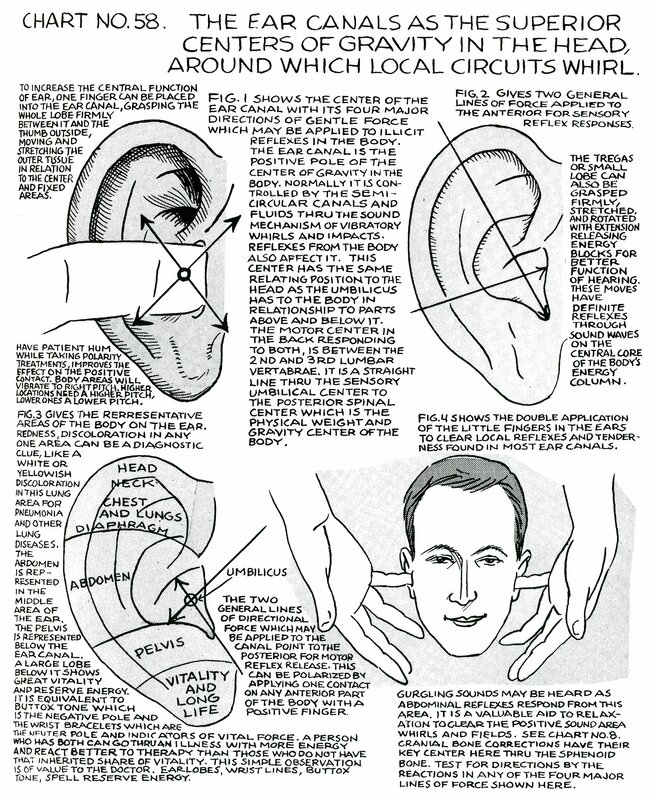 To increase the central function of ear, one finger can be placed into the ear canal, grasping the whole lobe firmly between it and the thumb outside, moving and stretching the outer tissue in relation to the center and fixed areas. Have patient hum while taking polarity treatments, improves the effect on the positive contact. Body areas will vibrate to right pitch. Higher locations need a higher pitch, lower ones a lower pitch. Fig. 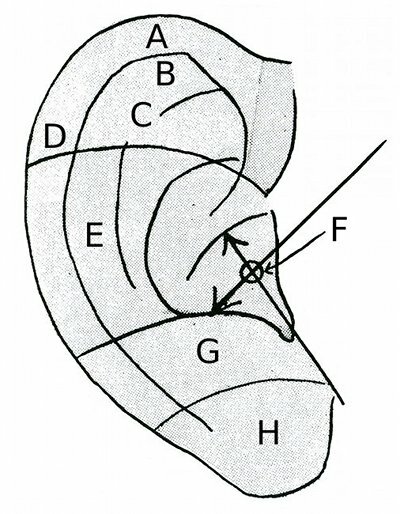 1 shows the center of the ear canal with its four major directions of gentle force which may be applied to illicit [elicit] reflexes in the body. The ear canal is the positive pole of the center of gravity in the body. Normally it is controlled by the semicircular canals and fluids thru [through] the sound mechanism of vibratory whirls and impacts. Reflexes from the body also affect it. This center has the same relating position to the head as the umbilicus has to the body in relationship to parts above and below it. The motor center in the back responding to both, is between the 2nd and 3rd lumbar [second and third lumbar, L2, L3] vertabrae [vertebrae]. It is a straight line thru [through] the sensory umbilical center to the posterior spinal center which is the physical weight and gravity center of the body. Fig. 2 gives two general lines of force applied to the anterior for sensory reflex responses. The tregas [tragus] or small lobe can also be grasped firmly, stretched, and rotated with extension releasing energy blocks for better function of hearing. These moves have definite reflexes through sound waves on the central core of the body's energy column. Fig. 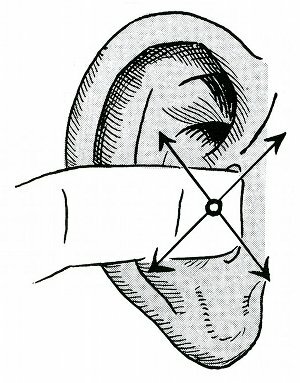 3 gives the representative areas of the body on the ear. Redness, discoloration in any one area can be a diagnostic clue, like a white or yellowish discoloration in this lung area for pneumonia and other lung diseases. 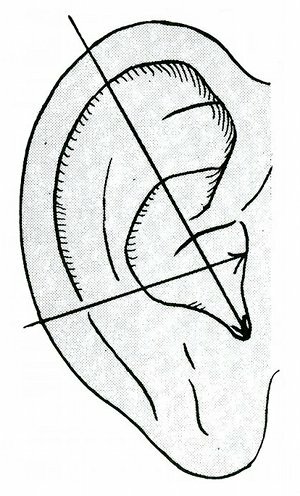 The abdomen is represented in the middle area of the ear. The pelvis is represented below the ear canal. A large lobe below it shows great vitality and reserve energy. It is equivalent to buttox [buttocks] tone which is the negative pole and the wrist bracelets which are the neuter [neutral] pole and indicators of vital force. A person who has both can go thru [through] an illness with more energy and react better to therapy than those who do not have that inherited share of vitality. This simple observation is of value to the doctor. Earlobes, wrist lines, buttox [buttocks] tone, spell reserve energy. The two general lines of directional force which may be applied to the canal point to the posterior for motor reflex release. This can be polarized by applying one contact on any anterior part of the body with a positive finger. 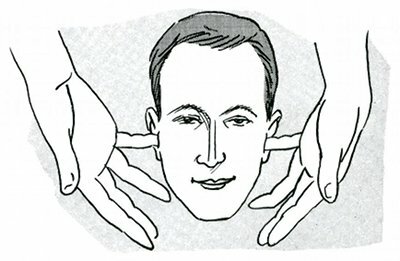 Fig.4 shows the double application of the little fingers in the ears to clear local reflexes and tenderness found in most ear canals. Gurgling sounds may be heard as abdominal reflexes respond from this area. It is a valuable aid to relaxation to clear the positive sound area whirls and fields. See Chart No. 8. Cranial bone corrections have their key center here thru [through] the sphenoid bone. Test for directions by the reactions in any of the four major lines of force shown here.